Where are the Tories on the EU Treaty? "David Cameron has given the strongest signal yet that the Conservatives would consider holding a post-ratification referendum on the controversial EU Reform Treaty." There's nothing bankable here: The words used by David Cameron - "If we reach circumstances where the whole Treaty has been not only ratified but implemented, that is not a situation we would be content with. We wouldn't let matters rest there" - are almost identical to those used by William Hague last month. They are not bankable. Eurosceptics who saw much firmer promises made about EPP withdrawal in 2005 are unlikely to be reassured by what looks like tactical wording. Brown's broken promise on the referendum is working politically for the Tories but voters aren't worried about the content of the Treaty: That's the political judgment of CCHQ. Brown's broken promise on the referendum has contributed to his low personal standing and the question marks over his character. Polling is not showing any serious evidence that voters are aware of the Treaty's far-reaching implications, however. The political calculus changes once the Treaty has been ratified: CCHQ is convinced that enough voters who don't want ratification now won't want the issue reopened if, as expected, the Treaty is ratified. What they believe is that there's a preference for the status quo and that status quo may well favour Brown by the time of the next General Election. The Tory leadership want to manage Britain's relationship with Europe, they don't want it transformed: Although all of the most senior members of the shadow cabinet are sceptical about the EU there is no stomach for a big fight with Brussels. One member of Team Cameron told ConservativeHome that they would not allow a Cameron government to be engulfed by the same "Euro-strife" that shipwrecked John Major. David Cameron was one of Michael Howard's inner circle who fiercely opposed a much-discussed suggestion in 2004 that the Tories propose a referendum on whether Britain should stay in or leave the EU. If he was cautious then he'll be even more cautious now that the Conservatives, ahead in the polls, have more to lose. Eurosceptics fear that some sort of deal has been done with Ken Clarke et al: It is widely thought that Michael Howard did some sort of deal with the party's leading Europhiles during his leadership. Has a new deal been done by David Cameron? The suspicion is that Clarke, Gummer, Heseltine, Hurd and Patten - all involved in the Cameron project to varying degrees - have been given assurances that the party will not make dramatic moves to fundamentally alter Britain's relationship with Brussels. ConservativeHome has been told that no such deal has been done but Eurosceptic parliamentarians remain unconvinced. The December ConservativeHome.com survey closes at midnight. If you haven't had your say yet please click here. By nearly two-to-one they reject the idea that military action must be authorised by the United Nations. Just over half agree with the controversial doctrine of pre-emption. Winston Churchill would have approved. He famously quipped: "You must never fire until you have been shot dead?" 86% want a bigger military. This confirms an earlier ConservativeHome Panel finding that defence should be the party's number one public expenditure priority. "When it comes to security there is a strong Conservative belief in being masters of our own destiny. While international co-operation is to be valued we must as a nation maintain the tools to act separately when our national interest requires it." Following last year's heroes and zeroes, Peter Ainsworth has made a new list for 2007. We publish them below with - in green italics - a few of our own observations. These figures come in today's Sunday Times and show a narrower Conservative lead than the YouGov survey published on the Friday before Christmas. We should probably be a little sceptical about polls taken over the Christmas period. Yesterday we shared our favourite video, moment and funny of the year. Today we've got three related more to ConservativeHome itself. Tim - Murdo Fraser MSP's article at the end of October: We must not allow nationalists to drive England and Scotland apart. Some of the ToryDiary threads on the Scottish question have turned quite ugly in the last few months. Murdo's piece hit all of the right notes and towards the end of the year David Cameron made it abundantly clear that he wasn't going to take risks with the Union. Samuel - Paul Goodman MP's essay in January on the problems with Islamism in the UK - Islamism: from analysis to action. At 2000 words it was twice as long as I normally like Platform pieces to be, but every sentence was worth keeping. Writing shortly after Despatches' Undercover Mosque programme and Policy Exchange's survey showing that 40% of British Muslims want Sharia law and one in eight young Muslims would "fight the West", he looked at what makes a moderate Muslim, ways in which they can be supported, and how they should respond to the problem that "all terrorists are Islamists, but not all Islamists are terrorists". We've had a very good run of Platform pieces in the last two weeks, including: Caroline Jackson MEP's criticism of the new EU party grouping, Andrew Mitchell's Boxing Day article on the lessons to be learned from the tsunami, David Cameron's piece on the situation in Afghanistan, Ben Rogers' and Nirj Deva MEP's response to Bhutto's murder, Mark Brooks' piece on male victims of domestic abuse, Greg Clark and Jeremy Hunt's explanation of their thesis that Conservatives are the new progressives, Greg Hands' anecdotes about the immigration service... et al. If you have an idea for an article that you would like us to publish, please feel free to email me about it. Tim - Iraq has dominated geopolitics for the last five years and the divergence of US and British policy towards the conflict was the most important real story of 2007. America, through General Petraeus' troops surge, showed that it was willing to try one more time to make the nation it liberated a half-tolerable place to live. Brown couldn't get out fast enough - infamously playing politics with British troop withdrawals. To say that Britain was defeated in Iraq is no slur on our courageous and badly-led troops but it is the truth. It was also disappointing that the Conservatives were unwilling to champion the surge at the outset or credit it when it had succeeded in delivering a massive reduction in violence. William Hague's response to Petraeus' success was bland at its best and the Shadow Foreign Secretary was too ready to credit Sunni leaders rather than American policy for the halving of violence despite the connectedness of the two developments. Only the odd pairing of Iain Duncan Smith and John Bercow spoke up for the surge in the Commons. I can only hope that David Cameron's recent visit to Washington signals the beginning of something different. Samuel - It's been a good year generally, I started working on the site and related projects on a proper full-time basis at the start of January and have been lucky enough to travel abroad a lot and get to know some great people down in London. The Party is generally getting closer to what I wanted it to be like when I joined. One regret that comes to mind ConservativeHome-wise is something that has been raised with me by a few candidates, and that is the critical comments about them being posted on here by readers. I don't believe anything particularly nasty or libellous has been put up (if you ever see anything like that please don't hesitate to email us and we'll take action asap) but it's fair to say that perceptions of some candidates have been coloured by what is discussed about them online. Other candidates laugh it off and say you need a thick skin in this game and also that it's healthy to be able to voice genuine concerns about an aspect of a candidates' past etc. Knowing which comments to overwrite really is a tricky one. We do try our best to avoid needlessly hurting anyone's prospects as well as needlessly muting opinions. Tim - One highlight was an ICM survey that showed that twice as many MPs used ConservativeHome as any other blog. I was more encouraged by the progress of the ConservativeHome Members' Panel, however. It was widely quoted by the mainstream media during 2007 but when it showed unhappiness with David Cameron there were often 'shoot-the-messenger' complaints that it had been infiltrated by non-Tories. But, after the dramatic events leading up to Bottler Saturday, there was a massive bounceback in the standing of Cameron and George Osborne, in particular. Exactly the same population that had been dissatisfied was now largely satisfied with the direction of the party. In recent weeks I've met a number of shadow cabinet members who have admitted that their own local Associations were decidedly negative from the grammars schools row until the Blackpool Conference. The grassroots may be open to the charge of being fickle but the monthly panel survey does capture the temperature of the membership. ConservativeHome's Agenda/ Manifesto for 2008 - launching on 7th January - will be based on Panel findings. The December survey is still live here if you want to have your say. Samuel - We had a fun but busy night liveblogging the local/Welsh/Scottish election results in May. Rather surreally we were doing so from St Stephen's Tavern opposite Parliament as the BBC had commandered it and filled it with pundits and cameras. We got information from grassroots activists from all over the country as well as some senior bods in Party HQ, which meant we were very often ahead of the TV networks. I think we left at about 5am and continued coverage a few hours later. I felt we'd done a good job of aggregating what was going on in the media and providing a place for Tory anoraks to chat about it all (there were almost 600 comments). I look forward to seeing how we can cover the next general election. Do the sermons of the world's churchleaders resemble Guardian editorials? That was the conclusion of Giles Fraser writing in the Thursday edition of Britain's leading left-liberal newspaper (and featured on the Today programme at 8.50am this morning). Rev Fraser, Vicar of Putney, reflected on the Christmas messages of key churchleaders. There was Rowan Williams' anxiety about global warming. Cormac Murphy O'Connor's focus on asylum seekers. The Pope's concern about war. Concern for the environment, for the asylum seeker and a disposition against war are not signs of being left-wing. That they are popularly perceived as such is a failure of Britain's centre-right. For too long Conservatives have allowed Labour to claim a monopoly of the moral high ground. It is one of the most promising aspects of Project Cameron that Conservatives are now beginning to compete with the left on issues such as conservation and social justice. There is a tendency to over-emphasise certain issues and neglect others. Britain's churchleaders can, for example, be accused of talking too little about the family, about the unborn and about the dangers of large, centralised government. Churchleaders can quite properly discuss the environment and poverty but they are wrong to recommend big state solutions to those problems. Free market solutions to pollution and the role of civil society in leading the fight against poverty are routinely neglected. Most importantly there is a politicisation of Christianity. The churches that are emptying across Britain are the churches where the ministers have given up on evangelism and are talking constantly about "issues". Britain's healthiest churches are the Bible-believing churches and the churches that are running their own social action projects - not waiting for government to act. "It is traditional at this time of year for commentators to misrepseresent the Christmas story, urging more social housing to deal with the problem of homelessness. If they read the bible story more carefully, they would see it was not a housing shortage but a hotel bedroom shortage that caused the trouble. This shortage had been brought on by a nasty government, forcing people to travel away from their homes to the large towns and cities to register and to pay a tax. It was some kind of combination of an an early forerunner of ID cards with a poll tax." Related video: A two minute video finds both Democrats and Republicans wanting: Who would Jesus vote for? Tim - I've cheated in this category and chosen two winners and both really are picks of the year. Viral videos will be big at the next election and not for the squeamish but Guido Fawkes' video of Gordon Brown appearing to repeatedly pick his nose while sitting next to Tony Blair at Prime Minister's Question Time has been watched hundreds of thousands of times on YouTube. The Australians also proved that politicians can never hide from their on-camera past. This vintage footage of Kevin Rudd eating his ear wax during a parliamentary debate was one of the most watched videos of the downunder election. Unfortunately it wasn't enough to stop Labor's Rudd from ousting John Howard. Samuel - A World Without America was the most successful viral video we made when based at 18 Doughty Street at the start of the year. It showed a British newsreader reporting on various crises that wouldn't have happened in a hypothetical world in which America didn't exist. It sparked both delight and hostility in the US, with it being played on national news networks and talk radio shows and attracting 12000 (and counting!) comments on YouTube. A great example of how the internet enables you to get a message out relatively cheaply - in this case, that it's easy to take America for granted. Tim - This has been the most extraordinary political year and we are spoilt for choice in this category. Sam chose first and I probably would agree that 'Bottler Saturday' was the decisive political moment of the year. Avoiding being an echo, however, I'll choose the moment when Alistair Darling announced that the personal data of half the population had been lost by HMRC. I choose that moment not because it was the worst deed of this Government but because incompetence is its hallmark. The NHS computer fiasco, the release of foreign prisoners, the overpayment of tax credits, the run on Northern Rock, the mishandling of Foot and Mouth... This Government really would struggle to run a bath. Although Labour is deservedly seen as being at least as sleazy as the Major administration I do not think sleaze will kill Brown politically. It will be incompetence. Most voters don't expect politicians to be particularly ethical but they do hope for basic management ability. Samuel - Definitely Brown bottling out of the election. I feared we would have taken quite a beating from Brown if he called the election early. But, as Nick Robinson put it succinctly, he took the weapon that is choosing the timing of an election and "contrived to turn the weapon upon himself, wounding both his reputation and the morale of his party". He has lost his chance to ask to be given a chance. A couple of newspapers reckoned our exclusive story on it definitely being called off contributed to the disaster that was his announcement, which was nice. Tim - You can watch it on PlayPolitical here. Acting LibDem leader Vince Cable became a superstar in the Westminster Village because of his From Stalin to Mr Bean jibe. A cleverer and more human person would have laughed it off but Gordon Brown reacted with a stoney face. Mr Cable almost never made the joke. His wife had given it the thumbs down then he had tried it out on her. Mr Cable was not actually first with the Bean idea, however. That honour should go to Leo McKinstry who had made the Bean-Brown comparison a few days earlier in the Daily Express. Samuel - Tony Blair meets Catherine Tate, and isn't bovvered. For Red Nose Day Tate went into her famous chavvy schoolgirl mode and did a scene with Tony Blair in No.10. After she waffles for a bit he cuts her off and after a pregnant pause turns the tables on her by coming out with the immortal "...am I bothered" line. People were amazed to hear those words come from our Prime Minister and he did it pretty perfectly. A good reminder of how much of a class act he is. Can you imagine how it would have went if Brown did it?! Where will the biggest decisions affecting Britain be made in the next few years - the White House or Downing Street? Ousting Maggie or Black Wednesday - Which event hurt the Tories most? Labour or the LibDems - who's worst? Who was the best leader: Hague, IDS or Howard? Those are the four questions we've already posed in this occasional debate feature. Today, on the eve of US Presidential elections year, the debate is whether Britain will be more affected by the outcome of the race for the White House or the battle for the keys to 10 Downing Street? The battle for the White House will affect Britain most: Every major problem in the world requires American leadership. The next US President could be a protectionist with massive implications for world trade. When America's economy sneezes we catch a cold. Much of the growth enjoyed under Gordon Brown reflects the strength of the American economy. There'll be no progress on climate change if the White House vetoes it. America is the only nation with the military power to deal with terrorist-supporting states. The next President will decide what to do about Iran. America's missile defence shield represents our best hope of protection from rogue dictators with nuclear arms. Yes, the British election matters but there are not massive differences between the two main parties at the moment. George Osborne has pledged to match Labour on public spending. Conservatives won't pursue major reforms of our hospitals. All parties take roughly the same approach to climate change. Much of our domestic agenda is set by the EU anyway and the Tories propose no fundamental reform of our relationship with Brussels. A Tory government will surely be a lot more competent than Labour - it couldn't be less competent - but Brown V Cameron is not Thatcher V Foot or Atlee V Churchill. No, the battle for Downing Street obviously matters most to Britain: Britain is in decline again - economically, socially and in terms of its standing in the world. A Conservative government will change Britain's course. Britain will be set on a path to economic liberalisation. Taxes will be lower. Reforms to education, policing and family policy will begin the repair of our social fabric. We will operate a more humble foreign policy and put national security first. Although the choice of American President is important the differences between the Republican and Democrat candidates may not be as great as some imagine. Despite the Democrats' rhetoric they are not going to pull out of Iraq fast and corporate America won't allow the USA to become too protectionist. The Republican candidates will also be more open to action on climate than the Bush administration. The most important decisions affecting Britain over the next few years will be taken in Downing Street, not in the West Wing. "Political language has to consist largely of euphemism, question-begging and sheer cloudy vagueness." With that quotation from George Orwell, the Centre for Policy Studies introduces its 2008 guide to 'Newspeak' and "the language of bureaucracy [that] has long provided a convenient disguise for government action, or inaction." Anti-social behaviour: Anything of which the government does not approve. Bandwagon: Something a political opponent is jumping on when he is closely in tune with public opinion. Blue skies thinking: Uncosted ideas for further government activity. Community leader: A self-appointed or government-appointed leader of a community group. Czar: The well-paid head of a quango appointed to demonstrate activity in dealing with a problem (not to be confused with solving a problem). Dialogue (meaningful): The pretence of genuine two-way communication. Looked after children (referring to children in state care): Children who are not looked after. All too true but not - in our humble opinion - quite as good as Inigo Wilson's famous Lefty Lexicon of August 2006. Download a PDF of the CPS' Lexicon from here by clicking 'View'. 10am: The CPS' Jill Kirby writes about 'Newspeak' for today's Independent. ConservativeHome.com's monthly survey of readers is now online. In addition to the regular questions we are seeking your views on candidates for promotion to the shadow cabinet and also your views on Britain's electoral system. Please click here to have your say. 4.25pm: Rudy Giuliani's response: “The assassination of Benazir Bhutto is a tragic event for Pakistan and for democracy in Pakistan. Her murderers must be brought to justice and Pakistan must continue the path back to democracy and the rule of law. Her death is a reminder that terrorism anywhere — whether in New York, London, Tel-Aviv or Rawalpindi — is an enemy of freedom. We must redouble our efforts to win the Terrorists’ War on Us.” Washington Wire has other US reactions. 4.05pm: EU Referendum: "With probably over a million Pakistani immigrants in this country, there is also a strong domestic dimension. There are justified fears that violence in Pakistan might spill over into the streets of Bradford, Coventry and other major British towns and cities, or that perceived wrongs to Pakistan will visit the sort of action meted out to Benazir Bhutto. Either way, the assassination of Bhutto is a profound and dangerous development, and one from which no good can come." 4pm Fraser Nelson has already noted that Bhutto's Wikipedia entry was updated within minutes. YouTube also has a large number of videos capturing coverage of her death. This rudimentary video is the first tribute uploaded. "And so it went on, each speaker attracting warm applause from Euro-MPs who felt warm about the fact that they were applauding. Then an Italian Christian Democrat, a gently mannered Catholic, rose with a suggestion. Why didn’t we make a personal gesture? Why didn’t each colleague contribute a single day’s attendance allowance to the relief fund? Immediately the warmth drained from the room. Those who had been hoarsely cheering the allocation of squillions of their constituents’ money were stony at the thought of chipping in €290 of their own. (Long-standing readers of this blog will be aware that, on top of their salaries and various other perks, MEPs get paid for turning up and signing the attendance register.) The poor Italian sat down to one of the most hostile silences I can remember, and the idea was immediately dropped." Liberals want to spend others' money, not their own: I remember after the 1992 General Election hearing a Labour supporter moaning that the extra tax that they would have been happy to pay - had Kinnock and John Smith won - would now be denied to the NHS. After hearing this self-righteousness for what felt like a small eternity I suggested that she could always donate the money directly to her local hospital. She went deliciously silent - like the MEPs - on the subject. Peter Lilley once mischievously suggested a Voluntary Equality Tax for all such left-liberals: "By ticking the VET box on their tax return they would allow the Inland Revenue to remove any income or wealth in excess of the national average and redistribute it to whichever underprivileged group or public service the taxpayer designated. For some reason the idea failed to catch on among those who are normally so keen to promote a more equal society!" Conservatives are more generous than liberals: Research in the USA shows that conservatives are much more generous givers than liberals: "People who identify themselves as conservatives donate money to charity more often than people who identify themselves as liberals. They donate more money and a higher percentage of their incomes. It is not that conservatives have more money. Liberal families average 6 percent higher incomes than conservative families." (Thomas Sowell). Spending other people's money tends not to be efficient: All of this reminds me about Milton Friedman's four tiered hierarchy of spending money wisely: "There are four ways in which you can spend money. You can spend your own money on yourself. When you do that, why then you really watch out what you’re doing, and you try to get the most for your money. Then you can spend your own money on somebody else. For example, I buy a birthday present for someone. Well, then I’m not so careful about the content of the present, but I’m very careful about the cost. Then, I can spend somebody else’s money on myself. And if I spend somebody else’s money on myself, then I’m sure going to have a good lunch! Finally, I can spend somebody else’s money on somebody else. And if I spend somebody else’s money on somebody else, I’m not concerned about how much it is, and I’m not concerned about what I get. And that’s government. And that’s close to 40% of our national income." PS Back to the tsunami... if you weren't online yesterday you may have missed Andrew Mitchell MP's article on the work that the world still needs to do in order to be ready to respond to natural disasters. In our last post before Christmas (we return on the 27th) here is a brief guide to the eleven shields that have crowned ConservativeHome.com since our launch on Easter Monday, 2005. The shields represent the breadth of the ideal conservative coalition - 'the politics of and'. Each of us come to the conservative colours for different reasons. Our interests overlap and are sometimes in tension but we are at our best when we recognise that diversity is a strength and absolute unity is impossible. There needs to be respect for difference if we are to form a coalition that is broad enough for victory. Next is prosperity. If socialists come in to politics to redistribute wealth, conservatives prefer to start with the creation of wealth. This shield also represents fiscal and supply-side conservatives. Compassion is the third shield. Some of the greatest conservatives have been social reformers. This year David Cameron celebrated the example of William Wilberforce. Shaftesbury is another giant in the Conservative Party's one nation tradition. Iain Duncan Smith is the greatest champion of this tradition today. The conservative approach to compassion is distinctive. We understand that the institutions of civil society form the soundest basis for a caring society. School choice, zero tolerance of crime and a safety-net approach to welfare are other favoured hallmarks. Law and order is the fourth shield. For most conservatives the protection of the public is a primary responsibility of government. But it is not just about laws and policing, it is about the nurturing of what David Cameron has called social responsibility. Without responsibility from families, neighbours and businesses, order is impossible. Humanity is the next shield. The image is sometimes interpreted as being a statement about abortion. For many conservatives the defence of the unborn is foundational but this shield is actually meant to represent a broader understanding of a pro-life philosophy. In his 2000 inaugural address George W Bush said that "no insignificant person was ever born". That is what the shield attempts to capture. Conservatives believe in the importance of the individual or, as Catholic Social Teaching suggests, "the person". Conservatives will always put the value of the individual ahead of any system. "Christmas reminds us of a God who is completely committed to the weakest, who uses power only so that human life can be fuller, more peaceful and generous, who gives us the help we need to make our relationships stable and faithful – and who requires of us a complete honesty about ourselves, and gently, steadily, chips away our self-deceptions. Christmas tells us that our best instincts about human nature and what’s needed for a healthy world and society aren’t just things we’ve made up. They are rooted in the way the whole universe is shaped by God." Today's ComRes survey for The Independent is much more consistent with Friday's YouGov survey for The Telegraph than Saturday's ICM poll for The Guardian. ComRes gives the Conservatives a 41% to 30% lead over Labour with the LibDems on 16%. The ConservativeHome graphic will be added a little later. On a forced choice, voters agree by 48% to 36% that "it's time for a change; next government should be a Conservative one" over "prefer a Labour government to a Conservative one". That suggests that Brown is failing (has failed?) in his central mission to convince voters that he is the change that the country needs. It will also provide food for thought for Nick Clegg. Voters may be unforgiving if the LibDems prop up a government that voters think has had its day. Cameron leads Brown by 39% to 37% on 'best person to be Prime Minister' and by 51% to 31% on 'most likeable'. By 40% to 35% the Tories are thought to have the best frontbench. The one Christmas crumb of comfort for Mr Brown is that by 44% to 36% Brown is most trusted to take the British economy through a potentially difficult time in 2008. That might have been a more interesting question if the "2008" hadn't been included. The poll was conducted on 14th to 16th December so would not have registered any 'Clegg effect'. The Observer, seriously, and The Sunday Telegraph, flippantly, both report that Tory housing spokesman Grant Shapps is to sleep rough tomorrow night to highlight the growing problem of homelessness in Britain. "For 130,000 homeless children in England, this Christmas is unlikely to be much fun. These children are being forgotten and left behind. Lack of permanent accommodation can have a grave impact on a child's health and development with devastating consequences. The fact that the number of homeless children has doubled over the past 10 years highlights the Government's dismal record in creating more social housing. It is hard to escape the conclusion that their policies have been a dramatic failure in this area." And a whole series of Tories - including Ed Vaizey - committing to spend weeks with voluntary organisations as part of a Centre for Social Justice initiative. The CSJ initiative is the hardest to dismiss as a stunt. It involves our MPs spending serious time with a charity - getting to know their work and challenges. Over the last two years a number of MPs have got to know much more about the problems of homelessness, addiction and debt because of these 'immersion weeks'. PS ConservativeHome's Tim Montgomerie can claim to be one of the first Tories to do this work. In 1994 he lived as a 'single parent' for a week for BBC2's Lifeswaps programme to see if he could survive on benefits (picture above). He did just about manage! A strong majority of 73% agreed, with 18% disagreeing. That so many Conservatives sign up to the principle that we should always raise human rights concerns with foreign leaders is very encouraging, particularly as so many Conservatives are understandably wary of the phrase "human rights" after some of the non-sensical domestic incarnations of it. When Sam Burke proposed the idea of a Human Rights Minister who would take responsibility for such issues, an idea advocated by the Conservative Human Rights Commission this year, most of your comments were pretty hostile about the concept. In this context we're more interested in, for example, the right not to be used as a human minesweeper (or, if you prefer, the freedom to have legs). The fusty diplomatic attitude that such things are internal affairs that we shouldn't rock the boat over seems to be fading away in this country, if not in China! Happily, the 73% can be confident that the next Conservative PM will do as they wish as William Hague has said at least three times that human rights should be at the heart of our foreign policy. Just 26% agreed with this one, with 60% disagreeing. Many would have been dissuaded by the open-ended commitment to increase spending year on year, but support for the sentiment is still surprisingly low. Conservatives have good reasons to be sceptical of the long-term effectiveness of aid, fearing that it disincentivises home-grown solutions and perpetuates poverty. Conservative councillor and former aid work Jack Perschke recently articulated these concerns on our Platform section. There's no doubt though that if managed and targeted well, aid can save and dramatically improve lives at relatively little cost to us as an advanced and prosperous nation. 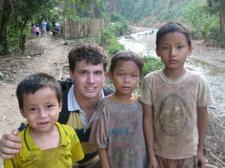 Samuel Coates visited refugee camps on either side of the Thai/Burma border last month. In such camps families either have access to medical care provided by aid agencies, or don't have any at all. It's not a case of them getting on their bike. Britain currently gives 0.5% of national income to international development, the highest share since 1964 but still short of the agreed international target of 0.7%. If you translate all the principles that David Cameron has outlined over the last two years about social responsibility from the domestic to the international arena, this doesn't seem too unreasonable a proportion for the government to contribute alongside third sector initiatives. An Englishman's home may be his castle, but it's ultimately not in his interest to stay behind the drawbridge. Britain is one of 192 villagers in this world. We have a duty to not only build up and defend our own house but to stand up to the neighbour beating up his wife, and help feed the neighbour at the other end of the road who has fallen on hard times. As some (by no means all) on the Left continue to equivocate and appease, can we add this principle to the reasons why Conservatives are today's progressives? A little good news for Gordon Brown at last. An ICM survey for tomorrow's Guardian puts the Tory lead at just 5%. The poll compares with an ICM poll at the very beginning of the month putting the Tories 11% clear and today's YouGov survey giving the Conservatives a 12% lead. Cameron has a 34% to 33% edge on Brown as best PM. Few people have an opinion of Nick Clegg but 19% say he makes them more likely to vote LibDem, 6% say less likely. The Guardian has also aggregated all of its polls since August and the key conclusions are that the Tories are beginning to do noticeably better in the north of England but Wales and Scotland remain infertile territory. Read more here. The Tories have a 12% lead over Labour in the latest YouGov poll, this time for The Telegraph. We've added Nick Clegg to the poll graphic although much of YouGov's survey was conducted before his narrow victory had been confirmed. The LibDems would have benefited from their leadership election 'being in the news', however, throughout the Monday to Wednesday period when this poll was 'in the field'. The poll finds that the Conservatives now have a narrow 34% to 31% advantage on which party is best trusted to manage Britain's economy. The Tories faced a 49% to 27% disadvantage at the last General Election. YouGov also identifies a clear majority of voters (58%) who are "inclined to disapprove" of Jacqui Smith's decision to phase in the police pay award. 22% are inclined to approve. 8pm: Very disappointing programme. It served as a neat summary of the ups and downs over the last two years, which is a useful thing for those who don't follow politics much, but it added nothing new at all apart from its accompanying commentary from the pundits. Cockerell did seem to dwell on the downs more than the ups and his tone didn't give Cameron any benefit of the doubt... but it could have been worse. He clearly didn't get much access, the only exclusive snippets of him talking to Cameron are when he catches him walking around at party conference. Regular readers of CH who missed it haven't missed much. 7.55pm: Do you think David Cameron will ever be Prime Minister? McKenzie: I hope not. Soames: Yes I do, sooner than you think. Duncan: Oh yeah, we're gonna win the next election. Heffer: No. Hamilton-Miller: I think he will yes. Portillo: The Tories have a very good chance of winning the election after the next. 7.50pm: Portillo goes on about only being able to win an election from "the middle": "sometimes I think a goldfish learns faster than the Tory party". 7.45pm: Cockerell catches IDS at conference, who advises: "It's not easy being a Tory leader... You've got to set your course and stick with it. Be sure of what you're doing and do it.". Lots of shots of newspaper cartoons mocking Cameron. 7.40pm: Duncan says the Ealing Southall by-election was a bop on the nose for Cameron, who had taken the risk of getting involved in it. Times were bad, and Labour MPs took to texting eachother with "PODWAS" - Poor Old Dave What A Shame. Heffer says Cameron doesn't like his party at all and regards its members as reactionary and common. What do you think of Nick Clegg's new Shadow Cabinet team? Do any of them have an interesting background in their new briefs? We must recognise the connection between wealth and fairness: "If we want to continue to lift billions of people in our world out of poverty…if we want to continue to spread opportunity ever more widely…and if we want to continue to transform and modernise societies…then we must continue to expand the economic freedom on which economic growth and the creation of wealth depends. Yes to free trade. No to protection. Being clear that globalisation is good for Britain, China and the world." Wealth can bring inequality and anxiety: "When I worked in Hong Kong briefly as a student in 1985, Shenzhen was barely more than a small town, surrounded by paddy fields and waterways. Today, Shenzhen is a city with a population larger than London. It makes most of the world’s iPods - and one in ten of the world’s mobile phones. But these changes – the product of economic freedom – can bring social unease. We see greater inequality – here and in the West. We see greater anxiety as jobs are lost as well as created – here and in the West." China is starting to accept the case for tackling climate change (no mention of action): "Some argue climate change isn’t happening. Fortunately, the weight of scientific evidence is steadily destroying their credibility. More worrying, others argue we shouldn’t bother to act, because nothing we do will make a real difference. "China’s building two coal-fired power stations every week", they say. "Why should we act if they won’t? These people have got China wrong... There is growing awareness across China of the fragility of your environment." Please click here to vote in the eleven categories. The shortlists were based on nominations provided by readers and then refined by the editors and informed figures of the conservative movement. The new Next Generation category has been merged into One to Watch, and we've added Scoop of the Year to recognise investigative journalists. In a joint interview the Tory leader and Shadow Chancellor deny that there was Brown-Blair Granita-style pact for one to seek the leadership first and the other later. “We did talk about the leadership. But we made it clear that – certainly I made it clear – that this was a decision for each of us as individuals. I could see the way David was thinking. He was absolutely up for it and he was going to go for it... Having a conversation with David about it in a way helped make my mind up. Not because he tried to dissuade me or anything, but because he was so clearly up for it and I so clearly wasn’t. So I thought absolutely the right decision was to very quickly rule myself out and then to be his campaign manager and get David elected. So we never had a deal." George Osborne won ConservativeHome's Campaign of the Year Award 2006 for managing David Cameron's leadership bid. His inheritance tax cut saw him shoot up our shadow cabinet satisfaction league. In members' valuation he now stands alongside the much longer-established William Hague and David Davis in terms of approval levels. In recent times Osborne formed an alliance with Andy Coulson to push the party away from the uber-modernisation that contributed to the trough in party support during the Brown honeymoon. Both men are currently in China. In a 36 second Webcameron interview - the first of a series - the Tory leader says that 'You can't be Britain's Prime Minister if you don't understand China'. Watch it here. 10.30pm: The Daily Mail's interview with DC/GO is now online. The key message of that interview (against ConservativeHome's view) is that Osborne will remain Shadow Chancellor; Cameron: "Everyone knows the huge recovery of Conservative competence over the economy has taken place while he has been doing the job. I'm not encouraging him to read up on anything else." They're both on PlayPolitical, as is this CBS news report on why John McCain is making a comeback. The return of the Patients' Passport? Against protests from David Davis, David Cameron rejected the Patients' Passport policy during the Tory leadership election... but is the idea about to return at the EU level? Tory MEP John Bowis hopes so. Speaking on the Today programme at 7.10am, Mr Bowis welcomed a Commission initiative (BBC report here) that could see a right to 'health tourism' introduced across the EU. UK citizens could enjoy a right to receive treatment from a health provider in another EU state if it was at a similar cost and if the patient had experienced "undue delay". Mr Bowis implied that the right might be enforced by European courts if Brussels did not act. Andrew Lansley: "Will he say whether he will support or oppose the draft directive to be published by the Commission tomorrow, or is he frightened that, in addition to the £490 million extra that we already pay for British residents abroad or visiting other EU member states, many more will choose EU continental European health care in hospitals that perhaps have lower infection rates or lower waiting lists? Are the Government going to support choice for patients or oppose it?" Alan Johnson: "The hon. Gentleman was doing well until the last bit. A couple of weeks ago, one of the Sunday newspapers took three pages to say that 70,000 people in this country had sought treatment abroad, when we treat 1 million people every 36 hours in the NHS. When one delved into the article, one found that those 70,000 wanted cosmetic surgery or cosmetic dental surgery that could not be provided in this country. It was portrayed as though people were, in the words of the hon. Gentleman, going abroad to escape long waiting times and get cleaner hospitals. However, the start of the hon. Gentleman’s point was absolutely right. We have to consider the directive carefully. I have not seen its terms yet—it is not published until tomorrow—but I have made it clear to Commissioner Kyprianou, as has the Minister of State, my right hon. Friend the Member for Bristol, South (Dawn Primarolo), that we must maintain the crucial principle that clinicians will decide what treatment to give in this country. We need to ensure that the principles that have guided the system for many years are not sacrificed to something that might seem like a good idea for a European directive, but which reduces patient choice in the long run." Labour are said to be resistant to a proposal that is still in very draft form and, if it happens at all, may be years away. A NHS industry representative on Today said that there were many objections on equality grounds to the proposal. To very easy questioning from Mr Humphrys he said that it would be a proposal that favoured the relatively young, mobile and rich. 9.30am: Fraser Nelson has posted on this topic: "The Labour left is angry about the rich escaping the NHS system by private insurance so you’d think they’d welcome the chance for the poor to do so as well. But no, they say this European plan threatens the foundations of their beloved NHS. I’d like to hear someone explain that to a patient. “Sorry Mrs Dickson, you’ll have to wait in agony for another year but your sacrifice helps protect the ideological integrity of the NHS”. It is a cause they are prepared for others to die for." 1.20pm: Fraser reports that Lansley is backing Brussels on this, apparently saying "What is the government so frightened about? Are they afraid of choice?"